Brush strokes of Nature has created some wonderful and beautiful surrealistic paintings on the Earth canvas. Few of these have already been posted in this travelogue. Here is the most famous of all - Face of Indian Head (Chief) in the Hills. It is located in South-East corner of Alberta, Canada. The figure is about 244 metres wide and about 529 metres high. This fantastic figure of a Red Indian Chief in full head gear is actually an optical illusion. In reality it is a natural terrain except for earphone and its wire which is basically an oil well and the road leading to it. The head portion of the face is a large drain area created through erosion of soft, clay-rich soil by the action of wind and water. It may have been created during a short period of fast erosion immediately following intense rainfall. Shadows and angle of satellite camera have enhanced the overall impact of the image in Google Earth. 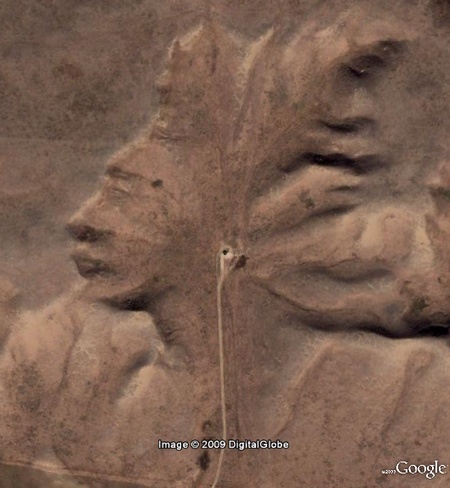 The face was found by "Supergranny" - a Google Earth spotter, who found it only on her second visit to Google Earth. This finding was aired in many TV programmes and was also widely covered in the press. However some doubting Thomases feel that it is man-made but there is no basis of their suspicion. Taking cognizance of this strange natural shape, the local council has named it as "Badlands Guardian". Supergranny's Original Post in Google Earth Community. More info Wikipedia - Press Report.